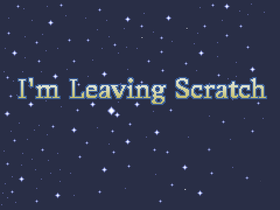 I've left Scratch. For two years, I'm leaving college and serving as a missionary for my church(LDS/Mormons) in Tallahassee Florida. Anyone can use assets from my projects if they want (give credit). Well, after seven years on scratch from 2010 to 2017, I'm finally leaving scratch. I've loved my time on this site, and can't wait for what the future holds in store.